The grand caravan buzzed over our heads at around 160 km an hour, turned out left and joined on a downwind leg before turning onto a final approach landing in an easterly direction. The moment had arrived and the contingent of ground crew comprised of Ministry of Environment and Tourism (MET), Intelligence Support against Poaching (ISAP) and of course personnel from M & Z Motors (Mercedes truck division) and Scenic Air who came on board to assist with funding and logistics. First National Bank (FNB) were the principal funders for the entire operation! The date - 27th November 2015. Relocating two prides of lions that had amalgamated to form one powerful hunting pride. Prior to this relocation, MET received reports of these lions coming through the fence line on the southern boundry side of Etosha National Park (ENP). We all know that to dart and relocate “problem” lions, distances of even a hundred km’s just does not work well – they will endure the journey and walk back. MET, after more than seven years of research conducted by scientific services, decided that the most viable home would be the southern part of the Khaudum National Park (KNP). Approximately 30 – 40 lions already roamed the 400,000 hectares of this park and there was definitely room for another eleven lions. A number of these lions were already fitted with GPS tracking collars so the territories and dispersion patterns were well known. Resident lion populations were taken into consideration and studied.Cognizance was taken into account of disease implications. The welfare of the translocation was also heavily weighed up. So all-in-all, the relocation of these lions was meticulously thought out and carefully planned by MET and ISAP. The initial idea was to load all the sedated lions onto a truck and drive the more than 800 km road to the north of Sikereti (KNP). However, this proved to be daunting in terms of prolonged sedation and especially taking into account the summer temperatures searing into the 40 deg Celsius. The road trip would have been more that 14 hours. ISAP rallied up financial support from M & Z Motors who provided a 4x4 truck and Scenic Air who prepared the Cessna grand caravan for this triumphant conservation occasion. Non-the-less, ISAP’s contribution to save these lions was a significant financial one and which included one lion GPS collar. WWF-Namibia supplied the additional three collars as part of the greater KAZA TFCA movement study of the North East. The flight from the south western Etosha boundry took one hour and thirty five minutes. This was for one load only comprising of six lions. The Cessna Grand Caravan captained by Mike Bottger (ISAP director) would return to pick up the remaining five lions. 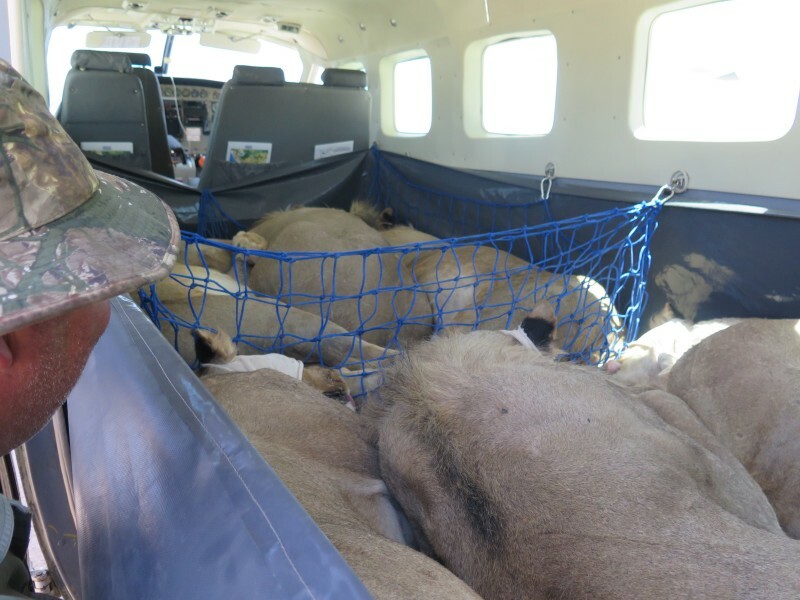 MET took turns with the ferry, monitoring vital signs of the lions whilst at an altitude of 7500 ft.Once all the lions were offloaded at Tsumkwe airfield, they were placed under the shading of a large ISAP branded gazebo. To prevent overheating, the lions were doused down with water sprayers. The road trip from Tsumkwe airfield to the “drop off zone” north of Sikereti campsite would take just on two hours. This trip was filled with some interesting twists. Note, that as a prerequisite for ISAP to publically disclose this story, MET had to first determine and declare that this was a successtranslocation in all aspects. It’s now 12:30 and the first batch of lions have been offloaded at the Tsumkwe airfield, it’s now time for the ground crew to do what we’ve been waiting for, the two and a half hour drive to the “drop off zone” just north ofSoncana waterhole. It’s now 36 deg Celsius, the lions have been sprayed down with water and we are all ready to go. MET has a lead double cab in front with the vet. The M & Z 4x4truck follows closely behind with the “cargo”. We are barely 12 km’s out of Tsumkwe when the Mercedes truck stops. This was just one of many stops as a mandatory check to ensure that the lions are still fast asleep. Suddenly I noticed five San kids appear from nowhere out of the bush and believing that this was a pit stop to offer them a lift, they run to the back tailgate to clamber on. It was as though everything was in slow motion and an extremely long pause before they froze. I guess they couldn’t believe their eyes. In unison, the kids jumped off the truck and looked at one another in what must have been disbelief! Where in Africa does this happen? Three more on route stops and we finally arrive at a suitable spot where we offload the first six lions. Once on the ground, still in a deep sleep, they are overshadowed by a huge camelthorn tree. The partial pride is now split between the Omaramba and Soncana waterholes. A final inspection and the monitoring of the lions vital signs takes place before the lions receive the antidote and are woken up. It’s also important to ensure that there is no interference from elephant and hyena. The southern part of the KNP hosts a formidable number of these marauding carnivores. We now have six lions sleeping under the camelthorn tree. They have all been branded, body measurements taken, identification photographs taken of their teeth, whiskers and full body. It’s now time to administer the antagonist drug, more commonly known as the wake up drug, reversal or antidote. In this case, atipamezole as well as yohimbine will serve as the wonder antidote – but because of the “top up’ anaesthesia drugs throughout the day, it will take quite some time before the pride is on their feet and stable. It’s now 18:45 and there is some lion movement. At least four lions are sluggishly moving their heads, trying to figure out where they have been all day long … and where on earth they are. Slowly they are all sort of awake, albeit swaying still as though a terrible punch concoction has been consumed out of a halved watermelon. We watch intently as they make their way into the thicket and disappear. It’s now 19:30 and the sky is a deep orange red with the sun having set. The next day we are all up early and again make our way to the airfield and wait for the Grand Caravan to make it’s second and last appearance with the remaining five lions which were successfully darted during the very early hours of that morning. Around the same time as the day before, the plane touches down. Same procedure as before, the lions are offloaded next to the runway, examined and then collared. For the final time, we make our way with the lions to the big camelthorn tree where the antidote will be administered. Again, the offload takes place, just like heavy bags of potatoes. Even worse as they are also soaked in their own urine … and so are we. Just as we are ready to open the tailgate, a familiar moan and grunting is heard. Some of the lions are waking up. The veterinarian scrambles for his drug box. We all peer over in disbelief at this somewhat premature discovery. No time to panic as the veterinarian swiftly fills the syringe with more zoletil and injects this immediately. Within seconds the lions are in a deep sleep. The five lions are offloaded before the antidotes are administered. Finally, with no incident the lions slowly awake and make their way into the thicket. From the Scientific Services desk at the Ministry of environment and Tourism, all four collared lions are monitored via their GPSupdates. As the months go by, it is evident that they have started to spread out as they discover their new turf. Occasionally one of the females wanders south outside the Khaudum park as though on her way to Tsumkwe. A few days are spent at one particular spot as demarcated by the blue dots once downloaded from the GPS collar onto Google maps. This denotes a very likely kill.So all seems fine with the lions in the park. A few months further down the line, a female was observed also walking in a south west direction. Her journey stopped at the veterinary fence line which runs from north to south, a mere 188 km’s away! Her territorial area comprised of walking up and down the fence line of about a 5km stretch. This was her hunting area and it is strongly assumed that she used the fence to chase the prey into and tactfully pin them down. This lioness hunted here for a period of six months. A decision was taken by MET to “retrieve” and return her back to the KNP. This was duly done with the services of a helicopter and the lioness was again released in the southern sector of Khaudum. Two weeks went by before this lioness undertook another journey, this time in a straight westerly direction ... towards the national road that goes to Rundu. MET headquarters Windhoek, the phone rings. A disgruntled villager reports a lion having taken out some of his cows – the location, northern side of the Mangetti National park which is situated next to the national road going to Rundu. A veterinarian from MET immediately grabs his drug box and drives to the location. Luckily everything falls in his favour and the lioness is sitting besides a dead cow and eating.The vet makes sure that the dart hits in the right spot, a buttocks shot. With the help of curious onlookers, the lioness is loaded into the back of the vehicle. A new release destination has been earmarked by scientific services – buffalo core area on the eastern side of the Okavango river! As the vehicle makes it’s way alongside the Okavango river in the Bwabwata National Park, the vet notices some twitching movement in the sedated lioness. To his astonishment she seems to be waking up a little prematurely. Without taking any chances, the vet stops and opens the tail gate to offload her. After perhaps twenty minutes she finds her way to her feet albeit swaying from side to side. She is now in the Bwabwata National park, a nicely wooded area and teaming with game, plenty water and of course new animals that she has never seen in her life before ... hippo, buffalo and crocodile. Over several months her movements are closely monitored. The first to make friends with her, are two prime coalition males that have taken up territorial reign in the small twenty five thousand hector Mahangu National Park – just across the Okavango River! These two males have swam across the somewhat broad and strongly flowing river over fifty times. We don’t know which of the two fortunate male lions mated with the newly relocated lioness. However, we do know that the lioness now has two sub adults. They have been seen many times by the MET staff as well as having been photographed by tourists. Today, the coalition males still brave the mighty river with it’s own deadly predator and pachyderms and frequent the Bwabwata National Park and of course their female companion.